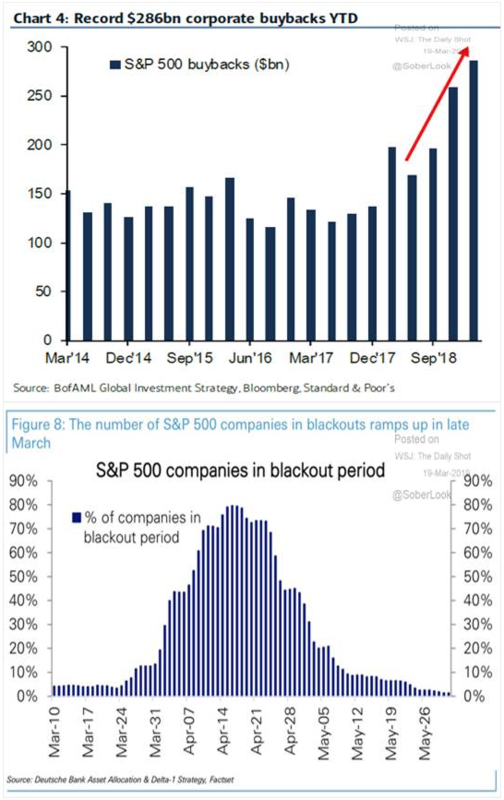 As the chart below illustrates, a great many public companies are entering blackout periods before regular quarterly results announcements. The blackout periods prevent companies and insiders from buying or selling their own stock based on inside information about earnings results not available to everyone else. But blackout periods these days also leave the stock market and investors very vulnerable to downturns since record corporate buybacks have been a major support for the stock market. In other words, without support from corporate buybacks we are entering a period in which the stock market is particularly vulnerable on the downside, even more so if there’s any market-moving negative events. So be careful!